You can set up a demo exhibition booth (one desk) behind the seminar venue. Those who wish to participate to exhibition are requested to Apply separately from raspi.jp. The registration area is at the entrance of Iidabashi Grand Bloom 2F where the venue is located. Please print out a receipt slip or be able to confirm participation application by smartphone etc. Exhibition of Raspberry Pi by users and companies. Sponsorship: RS Components Co., Ltd.
We will hold after party in the hall. Drinks and snacks will be prepared. Venue: Same as the seminar room. Programming for all the children! I sympathized with Raspberry Pi's will then made IchigoJam with 4K RAM CPU(100 yen) which runs BASIC. I aimed to create a door to the computer and the programming world . The compulsory implementation of elementary school programming in 2020 is also helping, and I use it in schools, soldering and programming workshops. 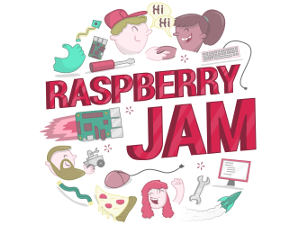 What is the next step I felt through the development of IchigoJam OS that works as a bare metal of Raspberry Pi!? By using SORACOM mobile data communication specialized for Raspberry Pi and IoT, anyone can easily start IoT with DIY. 3. The future of Sony's image sensors to support Open Innovation. With the adoption of IMX 219 to Raspi camera V2, we are ready to connect Sony's diverse image sensors to Raspberry Pi. I am very looking forward to knowing what kind of applications will be made in the IoT area using these and open innovation will occur. Sony will be actively involved in the scene and would like to feed back requests from the new market to products as quickly as possible. I will introduce the outline of the lineup prepared up to now, and application examples of long-distance high-speed image transfer of IMX 219 and IU 233 by Stream Technology. We will report the experiences of RAPIRO 's cloud funding both Kickstarter(UK) and Makuake(Japan), and the subsequent process and progress of manufacturing and selling. Also, we are planning to share the information about the project we are working with Tohoku Fukushi University, which is to utilize Raspberry Pi to support people with disabilities. With the arrival of the IoT boom, the number of people who play with the electronic handicraft has increased a lot. I was one of them and started to play some electronic handicraft with Raspberry Pi as a trigger. However, there are still many people who are not familiar with electronic handicraft. So, I will introduce the IoT-ish stuff made with optical drive, Eject command and simple operation, which I call "Eject command handicraft" and show you how to make something like IoT easily and cheap. Akkiesoft published BIG Raspberry JAM Tokyo 2016.